This two-storey building, bluestone at ground floor and brick at the second storey, has a Dutch gable parapet in front of its iron gable roof, and mild Italianate detailing above the first-storey windows that feature segmentally arched heads: the windows are timber-framed double hung sash. The front window and door openings have changed little (save for the removal of a canopy course) from when The Hassell Press first started operating in this building. George Hassell founded his printing business at Leicester, England, 18 years before migrating to South Australia in 1883, where he first opened a works in 1885 on the western side of Victoria Square. Hassell expanded to premises at 4 Franklin Street, next to the General Post Office, and by 1910 the press was operating from 104 Currie Street. Until George Hassell retired in 1900, he produced mainly small newspapers and did job printing. He died in 1917. His sons, George Frederick Hassell (1869-1945) and FH (Fred) Hassell, continued the business until 1922 when FH Hassell retired, and FW Hassell (the third generation), entered the partnership. The name G Hassell & Son, used since 1894 at least, then changed to The Hassell Press. GF Hassell’s high standards were maintained by his son, ‘at whose request the firm in 1953 merged with Griffin Press Ltd’. The Hassell Press was involved in all types of printing. It undertook work for the University of Adelaide (from 1904) and worked with publishers FW Preece and Macmillan of London. The Hassell Press was printer to the publisher, Wakefield Press in the 1940s which continues today as an important publisher of South Australian literature and non-fiction works. It building operates as a commercial premises. The building is of heritage value because it retains its original scale, form and fabric and exhibits good quality external detailing. It is of value also for the manner in which its distinctive design and detailing reflects the changing commercial nature of Currie Street. 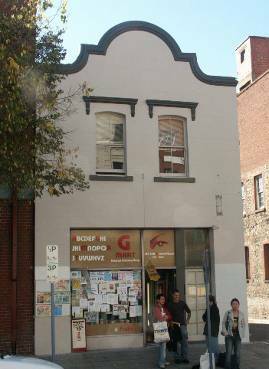 The building is particularly significant because of its long association with The Hassell Press, one of Adelaide’s premier printers, publishers and binders. The Hassell Press was an integral part of the business of type-setting, fine printing and publishing that was such an active and necessary part for several decades of inner-city activity. It illustrates several key themes in the city’s history: 2.6 City Dwellers: Small business owners; 3.1 Economic Cycles; 3.5.2 Retail and Wholesale Industry; 4.3 Development of the Building Industry, Architecture and Construction; 4.5.2 Victorian Commercial (1870s to 1890s); 4.6 Heritage and Building Conservation; 4.7.1 Adaptive re-use.